Send 'International Committee of the Red Cross (ICRC)' vacancy to your friends! The “Movement” is made up of the following components: the International Committee of the Red Cross, the National Red Cross and Red Crescent Societies and the International Federation of Red Cross and Red Crescent Societies. The International Committee of the Red Cross is an impartial, neutral and independent organization whose exclusively humanitarian mission is to protect the lives and dignity of victims of armed conflict and other situations of violence and to provide them with assistance. The ICRC also endeavours to prevent suffering by promoting and strengthening humanitarian law and universal humanitarian principles. Humanitarian missions enable you to protect and assist people enduring the consequences of conflict. You can help them find ways to cope and to build bridges to a more secure future, and lobby on their behalf for sustainable solutions to their plight. A broad range of new experiences awaits you. They will change your perspective and draw you into a whole new world. The videos in this “Working for the ICRC” playlist show the life of our staff in operational contexts and the different jobs the ICRC offers. We update the playlist as often as we can but you can always find all currently open positions here. 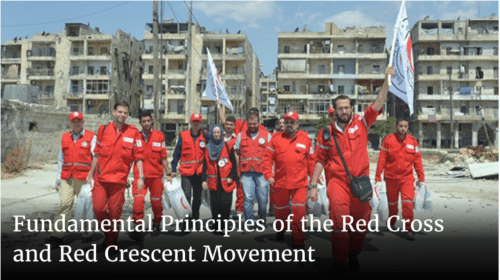 The seven Fundamental Principles provide an ethical, operational and institutional framework for the work of the Red Cross and Red Crescent Movement around the world. They are at the core of the Movement’s approach to helping people in need during armed conflict, natural disasters and other emergencies.